Gematralator brings the fascinating world of Gematria (numerical word equivalents) to your Windows-based PC. Type any word in Hebrew, and see its numerical value instantly. Then, the program will provide a list of all the words that have the equivalent value, with their location in the Chumash. 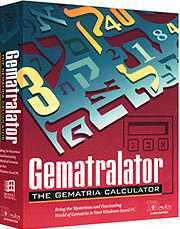 Gematralator even includes nine different methods of calculating Gematria! If you enjoy Gematria, then you will enjoy Gematralator. It's an amazingly versatile tool that will lend spirit and spice to speeches and Divrei Torah for all occasions. Any questions prior to ordering? - then email: Sales or call us on 0870 766 3699, otherwise proceed to the Order Form or Buy now.